Even Jamaica’s Veronica Campbell-Brown runs a season best 10.89. The wind was a legal +1.2. If it were not for the Flo-Jo’s 10.49 alleged wind assisted world record, we might see a WR in the women’s 100 meters next year. UPDATE: Check back on this site in a few hours for the latest YouTube Video of the Carmelita Jeter’s 100 meter 10.64 race, courtesy of EuroSport! Congratulations to Carmelita Jeter on her outstanding performance. 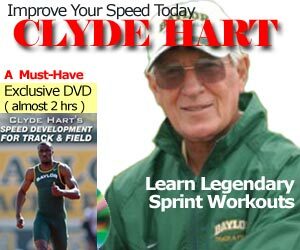 Our Jamaican sprinters need to take note. Since she changes coach to John Smith, we can see a lot improvements from the 29yr old future world record breaker! she can manage to run 10.4 in two years time, i believe in John Smith Programme.